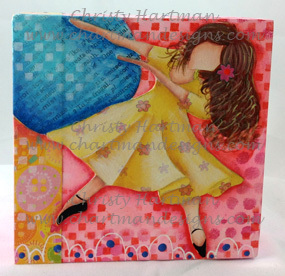 I love a wood canvas and these 4”X 4” canvases are fantastic to paint on. 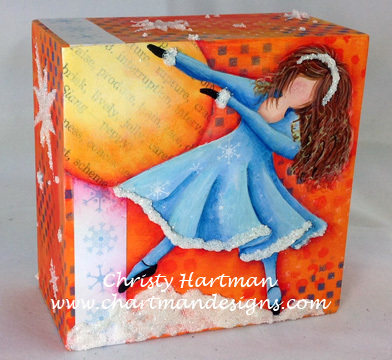 The deep edges provide you with another surface to continue the design/pattern onto. They stack marvelously or can sit side by side. These wood canvases are available from www.cdwood.com There are instructions in this pattern for three different canvases using the same line art. All three patterns are included with this E-Pattern as well as numerous photos. This pattern was first shown in an issue of the Pixelated Palette. 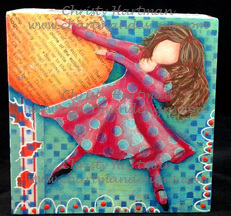 The girls on these canvases are dancing in the moonlight, I chose to use scrap pieces of patterned paper which I had in my stash for the girls but any similar colored paper will work and the moon is cut out of book paper. You are purchasing an E-Pattern and once payment has been received you will receive an email with instructions to download the pattern.